Brian Williamson – alternative dispute resolution. 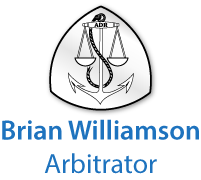 Brian Williamson draws on a rich maritime and noteworthy legal experience in dispute resolution. His maritime knowledge stems from a varied 13-year career at sea in the Merchant Navy from cadet to master mariner. During his time at sea, Brian sailed on a variety of ship-types, including crude oil and product tankers, bulk carriers, refrigerated and dry cargo ships and a period as navigator on large cross Channel hovercraft. He also completed a BSc honours degree in maritime studies at the University of Wales (UWIST) before turning to the law. In 1975, after graduation, his career progressed into the legal world, by joining a firm of shipping solicitors in the City of London specialising in all types of marine related disputes. During the 1980’s, Brian acted as casualty investigation officer for the Republics of Panama and Vanuatu, and for a short period acted as a visiting lecturer to the World Maritime University (WMU) informing students of the technical aspects of casualty investigation. Brian has acted as a consultant to the International Maritime Organisation (IMO), International Nuclear Services (INS) and Pacific Nuclear Transport Ltd. He served as a safety consultant to the nuclear industry on shipping for some 20 years, and from 2003 to 2009, was a delegate to the Informal Tanker Operators Safety Forum (ITOSF), where the world’s major tanker operators share best practice. In 2003, after 24 years handling contentious disputes as a solicitor, Brian became a full-time arbitrator. Since 2003, he has acted as arbitrator, mediator and expert determiner in more than 1,500 maritime and energy disputes.